I have something of a passing enjoyment of symphonic metal although it is a genre I need to take in smallish doses as it can sound a bit too similar from one band to the next. That said there are some real pearls amongst the genre's bands, Kamelot being one. I found them fairly generic until they released the stunning The Black Halo in 2005 and have picked up all their material since, which makes it kind of odd that I missed 2012's release Silverthorn! 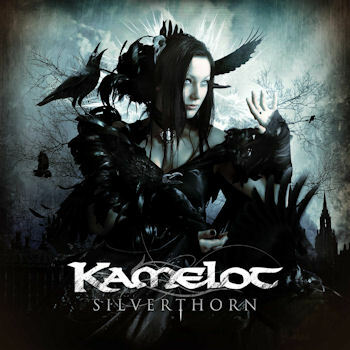 Silverthorn has the familiar Kamelot sound, but as Nightwish have also done over the last couple of albums, they have pushed the envelope somewhat with a more grandoise operatic somewhat dark carnivale influence extending into the lyrics, sounds and motifs. The album is a somewhat overblown concept album and is the first featuring new singer Tommy Karevik who does a sterling job replacing Roy Khan, no small feat given the latter's tenure of thirteen years at the helm. The additional of guest female vocals on some songs certainly adds to the whole experience.